Annual Focus gatherings are sponsored by the Rural Chaplains Association to provide both lay and clergy persons a supportive setting for sharing insights and perspectives on the state of rural communities, institutions, environmental/ economic challenges and religious /family life concerns. The gatherings bring together dynamic innovative practitioners from a wide variety of settings to share vital ministries that are transforming communities, institutions and congregations across the USA and beyond. While most Rural Chaplains certified by the association serve in the United States, there are others serving in Russia, Canada and England. Outside of the USA there are other groups that train and utilize rural chaplains (i.e. Australia). 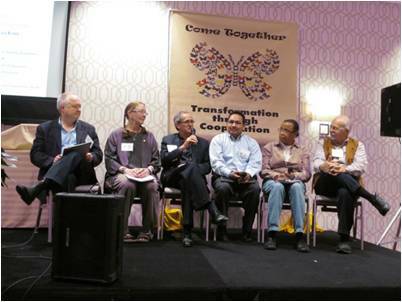 A panel from the 2013 RCA coordinated gathering, “Come Together-Transformation through Cooperation” focused on the many faces of cooperation for the future. gathering of practitioners and inquirers. The ninth gathering will be held in 2017. THE 2016 GATHERING IS SET FOR RURAL ONTARIO, CANADA October 24-28, 2016. – To learn about and experience the rich historical tapestry of the local people, cultures, and church traditions that comprise rural eastern Ontario in general, and Seaway Valley Presbytery in The United Church of Canada in particular. To hear and learn about the local current agricultural livelihoods and farms that help provide and drive the social and economic life in this particular area of rural eastern Ontario, Canada. To hear stories and testimonies from local congregants, lay leaders and ministry personnel/clergy about two innovative cooperative ministries and to learn more about the specific achievements of cooperatives to date, and the future challenges and opportunities they face in their particular rural context. To learn about services and ministries offered by local community groups and congregations serving persons with disabilities and, also, serving rural, isolated families in improving health care and early childhood education. A limited number of scholarships are available to assist certified Rural Chaplains in retaining certification & in “special needs” situations .